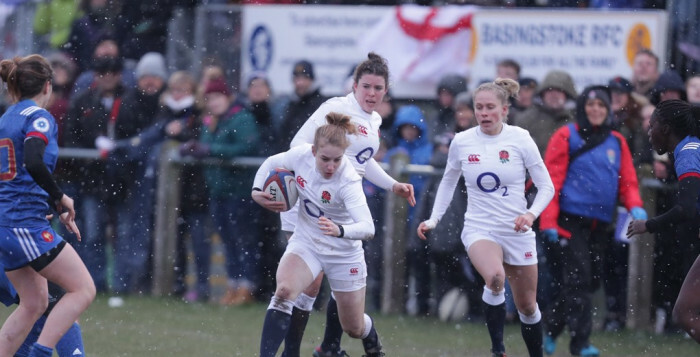 England U20s were beaten by France at Basingstoke RFC as they came from behind to secure a 10-17 victory, following England's win in France last month. Jo Yapp's side faced France in a return leg fixture, played in challenging weather conditions. England were first get points on the board as fly half Helena Rowland crossed the whitewash after five minutes but France responded with centre Aude Constans dotting down, leaving it 7-7 at the break. A penalty awarded to France in the second half saw them take the lead for the first time before replacement Charlotte Torres Duxan scored France’s second try, with Julie Coudert converting for a 7-17 lead. Despite Rowland taking advantage of a late penalty for England, it was too little too late as the game finished 10-17. England Women head coach Jo Yapp said: “It was an extremely tough game played in some really challenging conditions. "Despite the result we are really proud of the character that the girls showed and all credit to France they took their opportunities well. "There were some key moments in the game where we were just not accurate enough, the players are clearly disappointed but in their overall development they will learn a lot from this playing experience. 15. Emma Uren © (Saracens Women), 14. Lilian Stoeger-Goddard (Bristol Ladies), 13. Phoebe Murray (Bristol Ladies), 12. Lucy Attwood (Bristol Ladies), 11. Lizzie Adam (Loughborough Lightning), 10. Helena Rowland (Saracens Women), 9. Tazmin Bricknell (Gloucester-Hartpury Women RFC), 1. Ellena Perry (Saracens Women), 2. Leah Bartlett (Loughborough Lightning), 3. Ellie Mulhearn (Bristol Ladies), 4. Hollie Cunningham (Bristol Ladies), 5. Rosie Galligan (Saracens Women), 6. Tabitha Copson (Gloucester- Hartpury Women), 7. Charlie Wilcock (Worcester Valkyries), 8. Sarah Beckett (Firwood Waterloo Ladies). Replacements: 16. Ellie Gilbert (Gloucester-Hartpury), 17. Michaella Roberts (Bristol Ladies), 18. Hannah Botterman (Saracens Women), 19. Rianna Manson (Darlington Mowden Park Sharks), 20. Amelia Harper (Loughborough Lightning), 21. Ella Wyrwas (Saracens Women), 22. Cara Wardle (Saracens Women), 23. Emma Hardy (Loughborough Lightning).